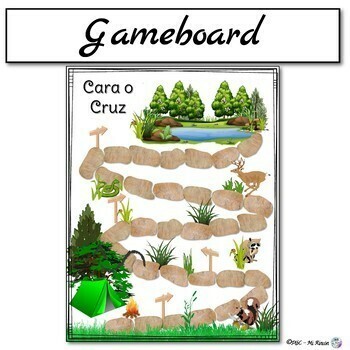 Add the element of competition to your Spanish classroom and help students become engaged as they practice the preterite tense verbs with this original game, Cara o Cruz (Heads or Tails). The students will have fun as they answer one of the 78 preterite tense verb questions in 5 different categories to move from the tent through the woods to the pond. 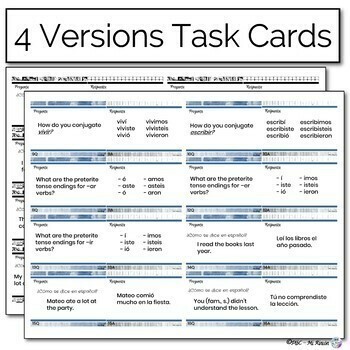 The preterite tense verbs activity can also be used in centers, no-prep class game, assessment, oral practice, Exit Tickets, Bell ringers, or other games. 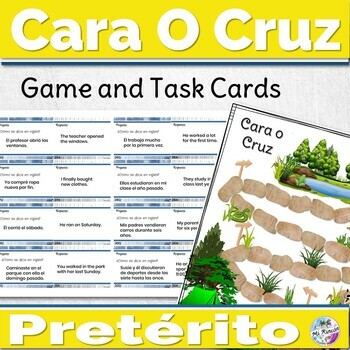 This preterite tense Spanish game is a real bargain to give students a variety of chances to practice & master regular forms of the preterite tense. Seeing and using these verb patterns will help students understand the preterite tense verb forms and be more comfortable consistently using the preterite tense in communication. This is a preterite tense verbs practice that your students will love! Please contact me by email (plbcspanish@gmail.com) with any questions or concerns; I am happy to help! Thanks for your support and interest!